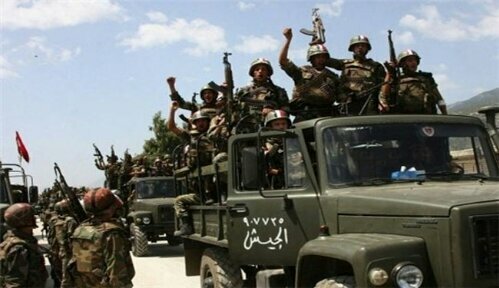 Units of the Syrian armed forces in cooperation with citizens regained full control over the town of Talfita and nearby mountains on the outskirts of Damascus. Syrian troops have regained full control over Talfita town and its suburbs near the al-Qalamoun region on the outskirts of Damascus, Al-Alam correspondent reports. Syrian army troops stormed the rebel-held town of Talfita on Monday and after fierce fighting with al-Nusra terrorists, killed dozens of terrorists and regained the control of the town, Al-Alam reported. After the victory, the residents of the area gave Syrian soldiers a very warm welcome. Syrian army sources pointed out the widespread presence of armed terrorists in the area and the nearby villages, had stressed to continue the mopping-up operations in the region. “We are here to establish security and stability with the help of locals and national defense groups,” a Syrian army soldier told Al-Alam correspondent.